In 1786, Bayou La Batre, AL was the first settlement on mainland in Mobile County. It is well known for its Ship Building and its Seafood Industry. 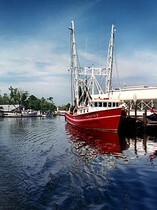 The local Chamber of Commerce gave Bayou La Batre the nickname, The "Seafood Capital of Alabama", because of the hundreds of fishing boats that call it home. The Shipyards are owned by local families and people from all over the World have had boats made in Bayou La Batre. The "Black Pearl" from the Disney movies "Pirates of the Caribbean" was built in Bayou La Batre. The area was devestated by Hurricane Katrina in 2005. The area has rebounded, but you can still see Shrimp Boats today that were carried in by the 16 ft storm surge.